Have you ever put a political campaign sign in your front yard? How about a bumper sticker on your car? Did that make your kids’ everyday lives better in any tangible way? Really? Seriously? Well, here’s your chance to put a sign in your front yard that will do just that. 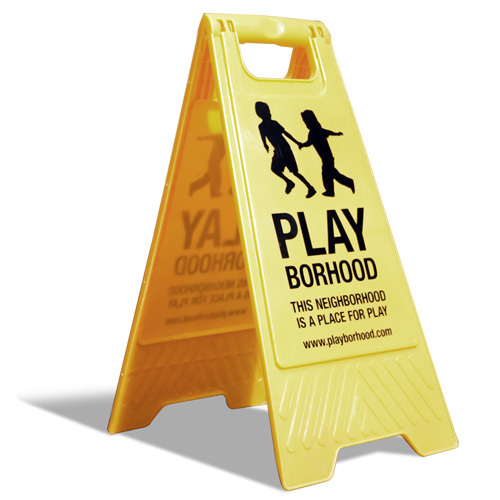 A vital part of the battle to create a Playborhood for your kids is convincing your nearby neighbors to join your cause. Putting this sign in your front yard will be an important symbolic step in that direction. Signs are two-sided, 12″ x 25″. Order one (or more) today! NOTE: If you’d like to purchase five or more signs, please Contact Us to inquire about discount pricing.